Photography possesses a powerful ability to bear witness, aid remembrance, shape, and even alter recollection. 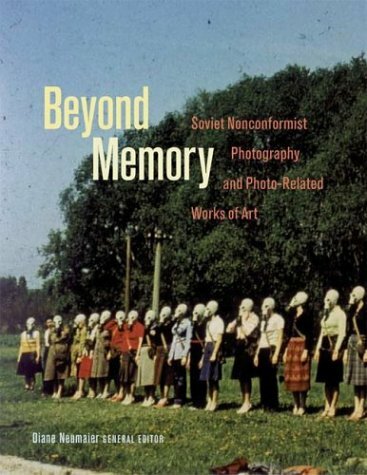 In Beyond Memory: Soviet Nonconformist Photography and Photo-Related Works of Art, the general editor, Diane Neumaier, and twenty-three contributors offer a rigorous examination of the medium's role in late Soviet unofficial art. Focusing on the period between the mid-1950s and the late 1980s, they explore artists' unusually inventive and resourceful uses of photography within a highly developed Soviet dissident culture. During this time, lack of high-quality photographic materials, complimented by tremendous creative impulses, prompted artists to explore experimental photo-processes such as camera and darkroom manipulations, photomontage, and hand-coloring. Photography also took on a provocative array of forms including photo installation, artist-made samizdat (self-published) books, photo-realist painting, and many other surprising applications of the flexible medium. Beyond Memory shows how innovative conceptual moves and approaches to form and content-echoes of Soviet society's coded communication and a Russian sense of absurdity-were common in the Soviet cultural underground. Collectively, the works in this anthology demonstrate how late-Soviet artists employed irony and invention to make positive use of difficult circumstances. In the process, the volume illuminates the multiple characters of photography itself and highlights the leading role that the medium has come to play in the international art world today. Beyond Memory stands on its own as a rigorous examination of photography's place in late Soviet unofficial art, while also serving as a supplement to the traveling exhibition of the same title.